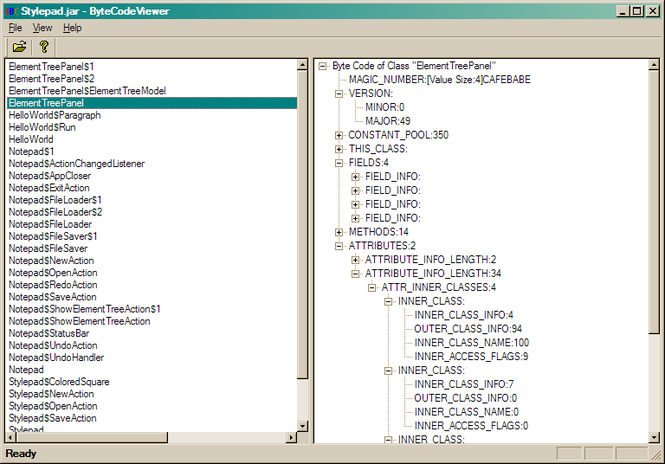 Browse: Home / Bytecode-viewer v-2.8.0 released : A Java 8 and Android APK Reverse Engineering Suite. 02/01/2015 – Updated CFR and Proycon to latest versions. 02/01/2015 – Started working on implementing Krakatau. 02/01/2015 – Sexifixed the security manager a little bit. 02/03/2015 – Fully added Krakatau Java decompiler, just disassembly/assembly left. 02/03/2015 – Updated the about window. 02/03/2015 – Dropped JRuby and Jython support (BCV is now roughly 16mb, was 45mb). 02/04/2015 – Added Krakatau Disassembly. 02/04/2015 – Added Krakatau Assembly. 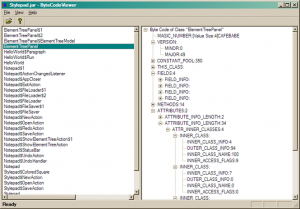 Bytecode Viewer is an Advanced Lightweight Java Bytecode Viewer, GUI Smali, GUI Baksmali, GUI APK Editor, GUI Dex Editor, GUI APK Decompiler, GUI DEX Decompiler, GUI Procyon Java Decompiler, GUI Krakatau, GUI CFR Java Decompiler, GUI FernFlower Java Decompiler, GUI DEX2Jar, GUI Jar2DEX, GUI Jar-Jar, Hex Viewer, Code Searcher, Debugger and more. + APK/DEX Support – Using Dex2Jar and Jar2Dex it’s able to load and save APKs with ease! + Java Decompiler – It utilizes FernFlower, Procyon and CFR for decompilation. 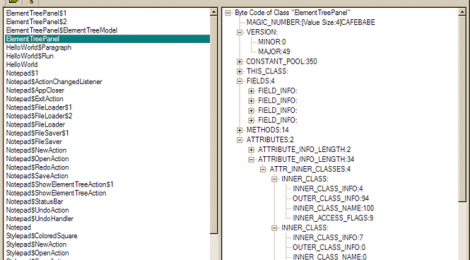 + Bytecode Decompiler – A modified version of CFIDE’s. + Hex Viewer – Powered by JHexPane. + Each Decompiler/Viewer is toggleable, you can also select what will display on each pane. + Fully Featured Search System – Search through strings, functions, variables and more! + Fully Featured Scripting System That Supports Groovy, Python And Ruby. + EZ-Inject – Graphically insert hooks and debugging code, invoke main and start the program. + Recent Files & Recent Plugins. + And more! Give it a try for yourself! ← Vezir-Project : Yet Another Linux Virtual Machine for Mobile Application Pentesting and Mobile Malware Analysis.